More than 40,000 University of California employees went on strike on Wednesday for 24 hours across UC campuses and medical centers in the largest strike of 2019. UPTE-CWA Research (RX) and Technical (TX) members are striking for a fair contract, and UPTE-CWA Healthcare and AFSCME workers went on strike in solidarity. They were joined on the picket lines by U.S. Senator Bernie Sanders, who spoke at a rally at UCLA, and other elected officials including Rep. Scott Peters (D-Calif.) and Assemblymember David Chiu. University of California's bargaining team recently presented what they are calling a "Last, Best, and Final Offer" for Research and Technical members of UPTE-CWA. The offer still contains unnecessary and unacceptable cuts including eliminating step increases for pay, no daily overtime or protections for full-time work, putting pension benefits in jeopardy by pushing new hires to choose a risky 401(k), and more. The offer would also limit the right to file a grievance in cases of sexual harassment and sexual violence. "For over a year, the University of California has continued to ignore the well-founded concerns of the workers that make this the finest research institution in the world," said Jamie McDole, president of UPTE-CWA 9119. 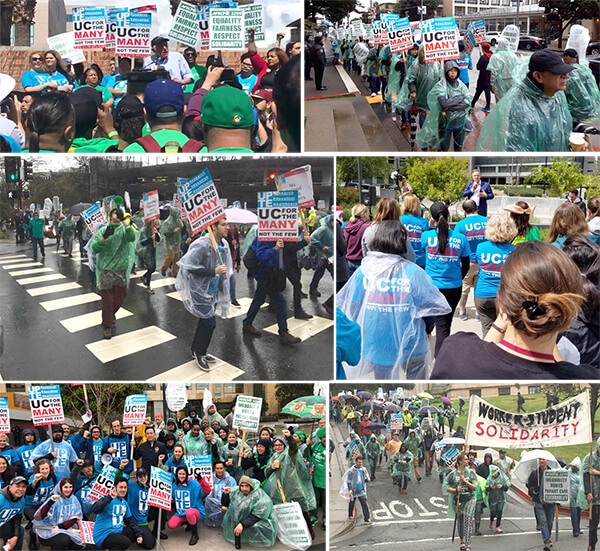 "By shortchanging the frontline workers who make UC run every day, administrators are showing a profound lack of commitment to the students, patients, and taxpayers that this institution is supposed to serve." "University of California must not be a corporate-type employer," said Sanders. "University of California must be a model employer–an employer that respects its workers and treats its workers with dignity. And it must sit down with its unions and negotiate in good faith." More than 40,000 University of California employees went on strike on Wednesday for 24 hours across UC campuses and medical centers in the largest strike of 2019. CWA members voted overwhelmingly to ratify an Executive Branch contract with the State of New Jersey. The CWA State Worker Contract is the largest collective bargaining agreement in the State of New Jersey. The agreement, which goes into effect July 1, 2019, includes across-the-board wage increases of 2% each year and a new health plan that lowers the employee health benefit premium share for the first time in eight years while providing significant savings to the State of New Jersey. The contract also includes improvements to due process rights, job security, and more. "Once again, we've proven that collective bargaining and workers' rights are at the core of American democracy," said CWA NJ Director Hetty Rosenstein. "When the parties negotiate in good faith, the results are always better, more long-lasting, and of greater value than when they are not bargained." The AFA-CWA Frontier negotiating committee has agreed to terms on a collective bargaining agreement with Frontier Airlines covering more than 2,200 Flight Attendants. The agreement includes significant pay increases, schedule flexibility and protections, improvements for reserves, better vacation, pay protections, quality of work life enhancements, and many other benefits. Elected Frontier Flight Attendant leaders will meet next week to vote to send the agreement to the members for ratification. NABET-CWA members voted by an overwhelming majority to ratify an agreement with NBC Universal on a new contract to replace the Master Agreement, which expired on March 31, 2018. The new contract includes wage and benefit improvements and covers all NABET-CWA members at NBCU, including nearly 3,000 staff and daily hire employees working as broadcast technicians in the studios and in the field for NBC News, NBC Sports, and NBC Entertainment, as well as other employees at company network and TV station operations in New York, Chicago, Los Angeles, and Washington D.C.